The Girl In The Clockwork Collar starts just right where Steel Corset left off. The gang, consisting of Griffin, Finley, Emily and Sam, travel to New York to find out what is the reason behind Jasper's incarceration and find a way to free him. 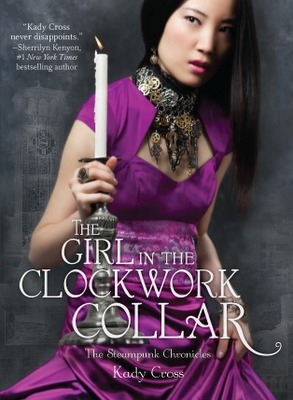 Those who enjoyed The Girl In The Steel Corset, will surely enjoy Clockwork Collar, as well. It has action, romance, scheming, betrayal. I liked all the characters, just like I did in Steel Corset. The line between good and bad is pretty distinct in both books. I would have liked the characters to be a little bit more flawed, have a darker side, too. The only one who is the embodiment of that is Jack Dandy (you remember him from Steel Corset, right?) who regretfully we don't get to see at all in Clockwork Collar. Too bad, I enjoyed his scenes in SC very much. I guess he was "replaced" by Tesla, who was interesting, to say the least. I am not sure if I love the crazy, kinda insensitive super scientist type of guy (think Dr. Bishop in Fringe) but he didn't annoy me either, which is good. Besides, his interactions were mostly with Emily, who I'm not crazy about, anyway. I love both Sam and Jasper and somehow I think they can do way better than Emily. I don't know why I have this feeling about this girl since Steel Corset. She just rubs me the wrong way. I kinda had the feeling Collar was a little bit less steampunk-y than Corset. Weirdly enough for me, that's a good thing. Also I would have liked nothing more but for both these books to be shorter at least 50 pages. That being said, I would recommend it to those who liked the first book and even to those who were on the fence about it.